Sample request letter for education trip to companies, organizations and NGOs from university, college or school. 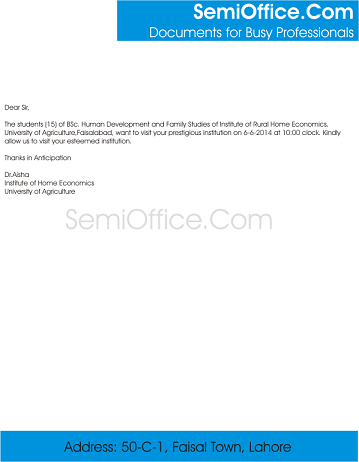 Sample letter of excursion from students to HOD, Principal, Headmaster or Coordinator. Apart from traditional lectures, field visits/Training is part of Community Oriented Medical Education. In this regard, students of 4th Year MBBS class of this College, visit various institution/establishments every year. In this connection, 103 students along with 4 X faculty Members intend to visit your institute on 18 Dec 2016 on Tuesday from 10:50 am onward. It is requested that necessary arrangements for the subject visit may please be made and confirmation of the same may please be communicated to Dr. Dilshah Pasha as soon as possible. The students (15) of BSc. Human Development and Family Studies of Institute of Rural Home Economics, University of Agriculture,Faisalabad, want to visit your prestigious institution on 6-6-2017 at 10:00 clock. Kindly allow us to visit your esteemed institution. Reference your letter this morning with letter ref. med/cmh/ about training visit of 4th year MBBS class students to our organization on Tuesday 25 December 2016. We will be pleased to welcome the visiting students and faculty members on 25th December 2016 at 10:20 am and briefing and visit to the facilities at our organization will accordingly be arranged. With due respect, I am writing this letter to ask for the permission to arrange a field trip to some old forts for my History course. This trip is very important for the students of history as they have to work on a research project and for that they need to visit different locations under the supervision of their instructor. For the trip we will be needed the college buses. I have attached the list of places we need to visit. I am really sorry for not being able to write to you last week as my pre board examination preparation tests session was undergoing. I have had a better percentage in this test session especially in Math, Physics and Chemistry. As you know I am having these test sessions over about 6 months now, I really feel that now I am gaining more grips over Math, Physics and chemistry. I will send you my cumulative result report of last 2 test sessions by 10 of January. Then my last session “send ups” will be left to attempt. Board papers will commence end of March. I wanted to take your kind permission for an excursion trip to Naran & Kaghan with Class and school teachers for a week. Papa I am really tired and want to have some mental relaxation for a few days before I give my send ups attempt. I am kind of room sick and my nerves need to relax. Excursion trip will be leaving on 15 January and will return on 19 January, under kind guidance and surveillance of staff teachers and Coordinator. The charges for excursion trip are Rs 5000 per head. Cambridge and Matric student badges will be going together. Also, this will be our last school memory, an excursion trip. I really don’t want to miss it as well I will have psychological relief from burden of studies for a while. I hope you will definitely allow me to go on this excursion trip with my fellows and teachers. I assure you that this excursion trip and relaxation will not affect my result and performance in send ups. I need to submit my dues and parents’ permission letter by 10 January. Kindly, reply me soon so I don’t miss this chance. Love you papa, you are my inspiration. Love you loads. I will keep updating you to whatever location we reach. I will send the detailed excursion trip destinations and transportation. Love you!